New EXPLORER-130M is a fantastic choice for the serious beginner and also receives high marks from more seasoned astronomers. 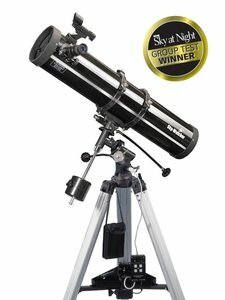 With an extremely useful 130mm of light gathering aperture, this telescope is a highly capable all-rounder for the observation of the Moon, bright planets, nebulae, galaxies and star clusters. Supplied with the EQ2 equatorial mount, which when polar aligned, will allow you to easily track objects as they move across the night sky via its slow motion control cables, or automatically with the supplied motor drive unit. Full instruction given. GREAT Beginner scope.